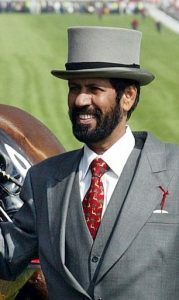 Dubai businessman Saeed Suhail has owned racehorses in Britain, predominantly with Sir Michael Stoute, since the 1980s. However, despite being a close friend and associate of the late Sheikh Maktoum bin Rashid al Maktoum, Suhail has never enjoyed the public profile, or equine firepower, typically associated with the Al Maktoum family. In fact, in those early days, Suhail remained something of a mystery outside his immediate circle, a situation not aided by his limited command of English. In 2000, Suhail recorded his first, and second, victories at the highest level, with King’s Best in the 2,000 Guineas and Dilshaan in the Racing Post Trophy but, even so, in the season as a whole managed just three winners from 30 runners. From that point on, though, his blue and yellow silks became a familiar sight in major races in Britain and, in 2003, enjoyed his best season ever, numerically, with 17 winners. Helped, in no small part, by the victories of Kris Kin in the Dee Stakes and, particularly, in the Derby, he exceeded £1 million in total prize money for the first time. In subsequent seasons, his fortunes ebbed and flowed and, while he collected several valuable prizes, including the Weatherbys Insurance £300,000 2-Y-O Stakes at Doncaster with Awinnersgame and the £250,000 Tattersalls October Auction Stakes at Newmarket with Kingship Spirit, both trained by Jeremy Noseda, in the autumn of 2008, he would have to wait another twelve years for his next Group 1 or Grade 1 winner. In October, 2015, Cannock Chase, trained by Sir Michael Stoute, won the Canadian International Stakes at Woodbine and, although he was one of just four winners that season, he sparked something of a revival for Suhail. In 2017, Ballet Concerto won the John Smith’s Cup, Sovereign Stakes and Superior Mile Stakes, while Poet’s Word won the Glorious Stakes and would go on to taste Group 1 success in the Prince of Wales’s Stakes and the King George VI and Queen Elizabeth Stakes in 2018. Indeed, in 2018, Suhail enjoyed his most successful season ever, in pecuniary terms, with over £1.5 million in total prize money.